It's too late for my home. There are LEGO bricks in almost every room and they're not going anywhere soon. The other day I compared it to the movie villain in "The Blob," it is just the slow, inexorable takeover of my house by tiny plastic bricks. Inevitably I try to run, but I trip and the next thing you know, my pants pockets are full of bricks and I've staked my claim to half of a bookshelf. 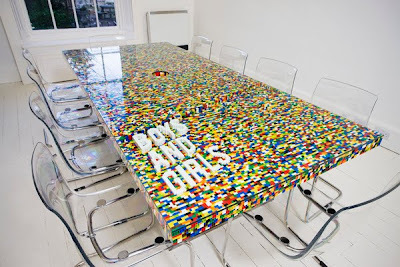 And since this is a hobby/lifestyle choice/obsession that extends beyond my home -- you will join us -- I figured you could at least look cool with a LEGO conference table. The one pictured above was designed for a British advertising agency Boys and Girls by design firm Abgc. There's a making of video here. As soon as I'm done building my LEGO phone, I'll totally ring you to set up that meeting.